(CNS): Around 40 people were involved in a fight between two gangs one from Bodden Town and the other from East End, which broke out in the very early hours of Saturday 28 November, at around 12:30am in the vicinity of the Pirate’s Bar in East End. The 911 Emergency Communications Centre received a call from a member of the public stating that there was a fight in progress outside the premises, and it was believed that machetes were involved. Medics responded to the location, but those involved refused medical attention or to be transported to the hospital. When they arrived, police said they were engaged in defusing tensions between the groups, and questioned those present or suspected of involvement in the matter, but according to the RCIPS, they were met with obstruction and unwillingness to identify those responsible or to detail what had occurred. Sources also told CNS that some memebrs of the gang could have been involved in a car crash while on their way to the hospital to receive treatment for their injuries sustained in the fight between the two rivial eastern district gangs. The matter is currently being investigated by officers from Bodden Town Police Station and anyone who has information regarding the incident is encouraged to contact the station at 9472220 or call Crime Stoppers on 800-8477 (TIPS). The RCIPS is hosting a gang awareness presentation on Thursday 3 December, at the John A. Cumber Primary School in West Bay at 6:30pm. The event is to provide information to parents, guardians and teachers alike to help determine if a young person is at risk of becoming associated with or is involved in gang activity. The presentation will be presented by RCIPS officers who have received certified training on this subject and will touch on the subjects of – what constitutes a ‘gang’, why people join gangs and signs of association, amongst other topics. They will also be available to answer questions. Do you recall when all you wanted for Christmas was a new bike? How you told your parents and wrote Santa your letter weeks prior to the “Big Day”? Do you also remember how your little eyes bulged with delight on Christmas morning when you saw that bright shinny new bicycle for the first time complete with a big red bow beside the Christmas tree on Christmas morning with your name on it? Santa had answeredyou. I currently living in Ho Chi Ming City (Saigon), Vietnam. 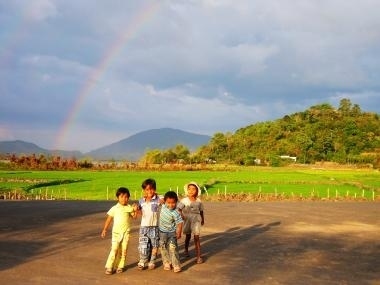 I have been here for nearly six months and I carry out charity work and also teach English. I would appreciate it if you would take the time to read the following story. I was teaching an English class about a week ago. The topic was “Free Time” and one of the questions was “If you had a lot of money, what would you do in our free time? As I scanned the class full of eager students sitting enthusiastically at their desks. I began to ask different students. Phoung, what would you do?”, I asked. “I would play a game teacher”. “What about you Van?”, I asked. “I would buy food for dinner for my family teacher”. “Tuan, what would you do, remember you have a lot of money?”. “Go out to a proper café teacher with my friends and order café da (Vietnamese black iced coffee) for all my friends”. It then dawned on me that these students had no idea what “a lot of money” meant. Most of them live in poverty with their extended family living hand to mouth in the daily grind of survival. So I chalked on the blackboard US$1,000,000 and turned back to the class. Their eyes widened, they had never seen so many zeros. “OK”, I said. “What if you had $1 million US dollars?”. “Tuan, what would you do?” “ Travel the world teacher”. “Next” I said and started again around the class “Go shopping for a week and buy everything I saw teacher”. “Teacher, I would buy a house for my family so we could all have our own bedrooms”. “Buy brand new motorbikes for my whole family”. Then I got to Tian. “I would like to buy bicycles for all the children in my village teacher, many children in my village live many miles away from the school and everyday they must walk for hours, sometimes up to 3 to get to class and 3 hours home.” Gosh, I thought how unselfish of this girl to think of others rather than herself. Since then I cannot get the image of those children out of my mind. Education is so important and those children have to be exhausted before they even get to school. Most return home and work for many more hours in their family paddy (rice) field. So I am appealing to you to make a different this Christmas to help me to donate as many bikes as possible. They will not be brand new but they will be new to each child that receives one. I would appreciate it if you would consider one your next “Dress Down Day” to donate the proceeds to the “New Bike for Christmas Appeal”. Perhaps your company willmatch whatever is raised by the employees. I will then be traveling to the school before Christmas to give the children their bikes. Remember that every dollar given could change the life of a child. Lets all join together and spread the joy of Christmas. To find out more about a local fundraising effort for this cause, read Bicycles will change lives in Vietnam in the CNS Christmas Appeal. (CNS): A fund raising effort in the Cayman Islands that will dramatically improve the lives of children in villages in Vietnam – one bike at a time – by helping them get to school without a 3-hour trek there and back, has already produced an outpouring of generosity. A volunteer at a village school found that some of the children have to walk several hours to get to school because there no bus and they cannot afford a bicycle. Sandra Ashmore, the sister of local real estate agent, Cathy Williams, has been living in Vietnam for the last seven months volunteering her time at an orphanage and at a local school in a poverty stricken area. Now Williams and Hilary McKenzie-Cahill have started a campaign, which they call ‘Little Feet Big Wheels’, to raise funds to buy bikes for the children. Each bike only costs US$21 and could change a child’s life forever in allowing them to get to school to get an education. ‘Little Feet Big Wheels’ has already raised around US$4,500, so the initial goal to raise funds for 100 bikes, which would be enough to buy one for every child in the entire village, has already been achieved. Now the organisers are now looking at expanding the project. Williams is asking for people to contribute as soon as possible so that she can get the funds to her sister to buy the bikes and get them to the village in bulk in time for Christmas. For more on this appeal, read New Bikes for Christmas, a Viewpoint by Sandra Ashmore. 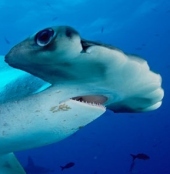 (The Guardian): The bizarre appearance of hammerhead sharks has led generations of marine biologists to ponder the same question: why the wide face? Part of the answer may now be at hand. Eye tests on species caught off the coasts of Florida and Hawaii show that the wider the head the better the shark’s binocular vision, and hence its perception of distance. The fish are thought to have evolved their wide, wing-like skulls to enhance their sense of smell and ability to pick up electrical activity from other marine life, but the latest study is the first to investigate the role eyesight may have played. (BBC): Religious leaders across the world have criticised Switzerland’s referendum vote to ban the building of minarets. The Vatican joined Muslim figureheads from Indonesia and Egypt, as well as Switzerland, in denouncing the vote as a blow to religious freedom. France’s FM Bernard Kouchner expressed shock at the ban which, he said, showed "intolerance" and should be reversed. More than 57.5% of voters and 22 out of 26 cantons – or provinces – voted in favour of the ban on Sunday. 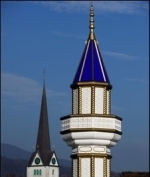 The proposal had been put forward by the Swiss People’s Party, (SVP), the largest party in parliament, which said minarets were a sign of Islamisation. 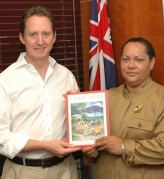 (CNS): The deputy premier was the first to receive a copy of Good Taste 2010, which arrived on Cayman this week. Accepting her copy of Cayman’s definitive dining and entertainment guide from Charles Grover, Publishing Director at Acorn Publishing, Julianna O’Connor-Connolly noted that, in its efforts to develop the tourism product in Cayman, the government was actively trying to promote the sophisticated Cayman restaurant scene and the variety of restaurants in Cayman as a key component of its tourism product. “The Good Taste magazine and website are major tools in helping us achieve this goal,” the DP said. Other sections that have been completely updated include: the Event Planning section, which is intended to be a guide to help anyone arranging special events from weddings, to private parties, to corporate events; and the glossary which helps explain some of Cayman’s more interesting culinary terminology. Island wide distribution of the magazine will start immediately. In total 70,000 copies of the Good Taste magazine will be distributed on and off Island during the year, making it the most widely distributed magazine in the Cayman Islands. The magazine can be picked up for free at the airport, car rental agencies, shopping plazas, hotel concierges, supermarkets and over 350 other distribution points on the Island. 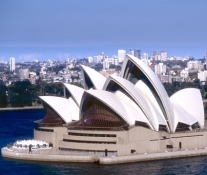 (Sydney morning Herald): Individuals and companies who fear that their offshore tax arrangements may spark a criminal investigation have been offered an amnesty by the Australian Tax Office. This precedes what the agency warns will be an ”all bets are off” clampdown next year on the use of tax havens to hide income. Under the tax office’s scheme, individuals or companies with undeclared offshore income can approach the agency anonymously for an ”indication” of whether they would be pursued by the tax office for a breach of criminal law. (CNS): The pathologist who conducted the medical examination on the badly decomposed body of Sabrina Schirn said she had died from multiple stab and chop wounds to her head and upper body. Mark Shuman explained that there was no single fatal wound that would have killed the 21-year old but that she died as a result of bleeding from so many wounds in her head, neck, face and upper back. Testifying in the trial of Randy Martin for the murder of Schirn, the expert witness told the court that there were more than twenty different incise and chop wounds, including defence wounds that almost severed two of her fingers. Shuman told the court that he could not pinpoint the time of death as the body was badly decomposed, but the state of the body was consistent with the prosecution’s estimate that she was killed on Wednesday 11 March. The doctor explained that the wounds ranged in size from around 3cms to as much as 19cms in length and some were multiple wounds in the same location. He also said the chop wounds on Sabrina’s body were consistent with a machete or an axe and the incise wounds with a knife. Neither the prosecution nor the defence asked the witness if one or two weapons were used or if the directions of the wounds could tell anything about Schirn’s killer. The pathologist described wounds to Schirn’s head, face, neck, shoulders, back and hands and explained how most of the wounds did not penetrate the bone, but many had severed muscle. Put together, the doctor said, they would have caused Sabrina to bleed to death. When asked by the defence if the assailant would be covered in blood after committing the murder Shuman said not necessarily as none of the wounds would have spurted blood but were more likely to seep. During the day’s court proceedings on Friday, the defence read in a number of agreed witness statements. They also called Schirn’s sister to the stand, who testified that Sabrina had wanted to borrow money from the family for a planned shopping trip to Miami, which they spoke about on the Monday before she died. Schirn’s sister told David Evans QC, when asked by the lead defence counsel about the relationships that Sabrina had been involved in, that she had some concerns about the thuggish boys she associated with from time to time. She also confirmed that Lance Myles, who had been in and out of prison, had told her he loved Sabrina and wanted to marry her. Another of Sabrina’s former boyfriends, who is serving time in Eagle House, told the court that he had lent gloves to the defendant Randy Martin just a few days before the murder. Andy Myles, who is serving time for armed robbery, said that before going to prison he and Sabrina were together, and although he tried to keep the relationship up when he was sent to Eagle House, she began to see other people. Myles told the court that he knew Martin, who although older had been placed in Eagle House for a time. Myles explained that he had gloves for doing construction work at the prison site and Martin had asked if he could borrow a glove for his farm work. Myles told the court that Martin had only one useful hand as his left arm had been crushed in an accident. Myles said Martin had claimed that his good hand was getting mashed up at work and he wanted a glove to protect it, but farm workers were not issued gloves by the prison. Myles confirmed that Martin was known as the ‘one armed bandit’ in the prison. Myles, who was visibly angry as a gave his testimony, declared that he thought Martin was evil and couldn’t believe he “had done these things", said he had seen Martin in different pants that were baggy on him on the day following Sabrina’s murder and how he had seen him washing his shoes in a garbage pail. Testimony also came from Officer Simpson, who is second in command of prison security at HMP Northward, who told the prosecution’s counsel, Cheryl Richards, that according to prison records Sabrina Schirn had visited Randy Martin at the prison four times during February and May of 2008. However, during cross examination by the defence junior counsel, Adam King, it became clear that the prison records were incomplete and inaccurate and that the security regarding visitors was almost non-existent. Simpson told the court that visitors were not routinely asked for ID and older people especially were simply allowed into the prison if they came and said they were visiting a prisoner and their name was on the prisoner’s list. Simpson also agreed that officers had filled in the visitor records incorrectly and had often put information about comings and goings in the wrong boxes. King questioned the witness and suggested that the errors on the visitor record made it confusing and unclear who had visited who and when. When asked, Officer Simpson was also unable to explain how Martin’s visitor records had come to have a photocopied sheet with visitor names on it stapled to the original sheet or who had copied what appeared to be a new record. When pressed by King to explain how he could possibly know it was Schirn when the records showed she had two different visitor numbers among other issues, Simpson was unable to explain. King asked if another woman was in fact the person who had visited Martin on those dates, and while Simpson insisted it was Schirn, he could not tell the court how he knew. King asked about CCTV footage of visitors coming to the prison and if it was kept and stored. Simpson said he believed itwas and agreed to find and bring the footage to court on the days he stated Schirn had allegedly visited Martin. The trial of Martin continues on Monday in court one before Justice Charles Quin. (CNS): As the 2009 Atlantic Hurricane Season draws to a close today (Monday 30 November), experts say it was the quietest season since 1997, and forecasters at Colorado State University claimed its team has accurately predicted the below-average hurricane activity. 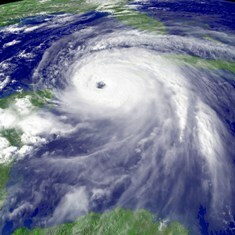 The season produced nine named storms with three hurricanes, two of which were major hurricanes. There was only one storm warningfor the Cayman Islands, which came with the late season storm Ida that passed some 190 miles west of Grand Cayman on 8 November. In their end of season report the predictors said the season compared with the team’s seasonal and 15-day forecasts. The Colorado State team of Phil Klotzbach and William Gray made its long-range seasonal forecast, which called for an above-average hurricane season, in early December 2008 and issued seasonal updates on April 9, June 2, and August 4, 2009. As hurricane season began in June, the team called for 11 named storms, five hurricanes and two major (Cat 3-4-5) hurricanes. In August, the team lowered their prediction to 10 named storms, four hurricanes and two major hurricanes. William Gray, who has been issuing forecasts for 26 years, explained activity was reduced considerably due largely to the moderate El Nino. “This event generated significantly stronger-than-average vertical wind shear, especially in the Caribbean and Gulf of Mexico,” he added. The hurricane experts said that five named storms (Ana, Danny, Erika, Fred, and Henri) dissipated over the open ocean in the tropical and sub-tropical Atlantic this year. This is a fairly rare occurrence that typically happens only in years such as this year, characterized by high levels of tropospheric vertical wind shear. Only two weak tropical storms made landfall this year – Claudette in August and Ida in November. The season was also a late-starter with the first storm not forming until 15 August. It also had the lowest number of named storm days since 1991 with 27.25 compared to 24.25 named storm days that season. With only three hurricanes in 2009, it was the quietist year since 1997 when there were also three hurricanes. In total there were 11.25 hurricane days and no category 5 hurricanes developed, the second consecutive year when the storms stayed below the highest level. No named storms formed in June or July. The last time that no storm activity occurred in June or July was 2004 (Alex formed that year on August 1). This is the 18th year of the past 66 years with no storm formations in June or July. The team will issue its first forecast for the 2010 hurricane season on Wednesday, 9 December. (CNS): Education Minister Rolston Anglin said this week that, despite the fact that he has issued a notice to quit to the general contractor on the two new high school projects, therestructuring of school organization will not be dependent on the building schedule. The minister gave notice of termination to Tom Jones International (TJI) last Wednesday, claiming breach of contract following the stoppage of work at the two sites earlier this month. Although government has given no details of what its intention is for the partially built sites, the goal of completing both schools by September 2010 is now elusive. “If the new school buildings are not yet ready at the start of the 2010 school year, the move to all-through school will still happen using existing facilities,” the minister said. “We need to decouple construction from much needed educational improvements." Plans are still in motion to introduction the changes to the Cayman Islands education system, as envisioned in the new education law passed by the previous administration, including the change from the current middle school/high school arrangement to two “all-through” high schools in Grand Cayman, which will cater to students aged from 11 to 16 years. Although during the election the UDP had talked of developing a separate vocational institution, the new administration has now revealed that it will be using George Hicks as the technical centre for post-sixteen education as intended by the previous minster. However, the implementation of the new education law, which was passed in March 2009, is still in question. 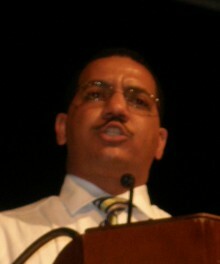 Although that law was intended to come into effect for the 2009/10 school year, when he came to office and was appointed education minister, Anglin said there was not enough time to complete the regulations by then, so the date the law would be implemented was postponed and as yet no new date has been set. Under the forthcoming educational plan, however, which is effective September 2010, students within each high school will be organized in academies, each with 250 – 300 students in Years 7 through11. A student will then normally remain in the same academy throughout their secondary education years the ministry said. In Years 7 through 9, when children first enter high school, classes will be conducted in the academy group, allowing the younger students the security of a smaller setting within the larger school. As students move into Years 10 and 11, they will have more opportunities for joining classes alongside students from other academies across the whole school, particularly in option subjects. The ministry stated that this would allow older students access to a greater range of specialized subjects and helps prepare them for the challenges of further study and the world of work. Students will then sit their CXC/GCSE examinations at the end of Year 11 from 2010 onwards. For the mandatory Year 12, students will be able to choose a personalized plan of study at the redeveloped George Hicks Centre for Further Education. She said the continuity provided by all-through secondary schools would enable teachers to get to know and nurture students over a longer period, allowing for better knowledge of their needs. She said it also permits a smooth transition to examination preparation in each subject area, as the same teachers are involved with students throughout their secondary studies. While Cayman Brac High School is already an "all through" school with less than 200 students, the ministry has still not said why the the reorganisation of academic study, particularly the taking of external exams in Year 11 followed by the additional compulsary year, will not apply to the Brac school.